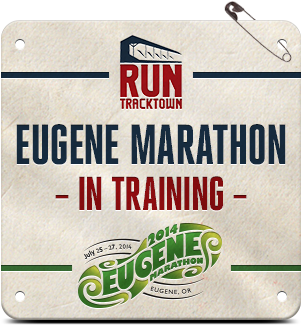 With less than 5 weeks until the Eugene Marathon, I’m starting to get a little excited. If you had asked me a couple or few weeks ago how I was feeling about this race, I would have had a different answer. But now that I am getting close to the taper and have one 20-mile training run under my belt, I’m feeling a little better. Tomorrow is my last training session of the 8-week training with SRA. I have actually liked going each week and getting in extra speed work, interval training, Fartleks and hill training. I train mostly by myself, so it’s been a nice change to meet up with the group and get some extra motivation. The hot weather has been a challenge at times, but I have been able to work around it most of the time. Getting up at 5am for a long run is definitely not my favorite thing to do, but I have to do it when it’s going to be a 90+ or 100+ degree day. If you asked my pal, Rick (an ultramarathoner), how he likes his training runs, he’d say the opposite. That crazy guy LOVES to run in the heat. This week is the 2014 USATF Outdoor Championships here in Sacramento and I am volunteering for 5 days of it. I’m super excited and this has also led to a spike in my motivation and inspiration! I will give a recap of my experience after it ends on this Sunday. 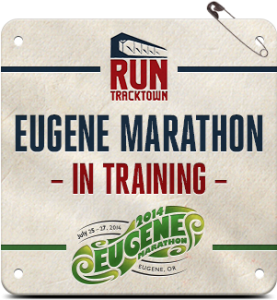 This entry was posted in Uncategorized and tagged Eugene Marathon, Training, USATF by amy. Bookmark the permalink. You’re going to kill it in Eugene and gain even more inspiration when you circle Hayward Field. Love your updates from Sac, can’t wait to hear all about the fun you’re having this weekend! Thanks Jenny!! I appreciate the love! I hope I can pull off a great race in Oregon!